If you are interested in purchasing a home for 300000.00 Canadian dollars and are interested in taking out a loan for $250000.00 at a 5.000% interest rate for 30 years, you will be required to put down a $75,000.00 down payment (required down payment is 25% of house list price for homes with prices below $400,000 and 35% if property costs more that that value). This means your monthly payment (principal and interest only) will be $1,334.23. Your total payments will be $480,316.13 for the life of the loan. This means you will pay $230,321.61 in interest. This calculator was designed specifically for conventional Canadian mortgages, with semi-annual interest compounding. The results also show the minimum required income for the home buyer. The following table lists U.S. mortgage rates. Eventually we will try to integrate Canadian rates, but these are a rough baseline of rates across the United States. Typically Canadian rates are slightly higher than U.S rates. Also most loans in the United States use fixed rates for the duration of the loan, whereas in Canada it is far more common for loans to reset based upon the performance of an associated index rate after 5 or 10 years. By default 30-yr fixed-rate loans are displayed in the table below. Filters enable you to change the loan amount, duration, or loan type. Canada may keep a low profile, but it is one of the wealthiest countries in the world with the eighth-highest per capita income in the world and a high ranking by the Human Development Index for quality of life, government regulation, civil rights and economic freedom. Canada is also home to some beautiful attractions, such as gorgeous mountain ranges, breathtaking waterfalls, sprawling vineyards and more. Some of the largest cities in the world are also in Canada. 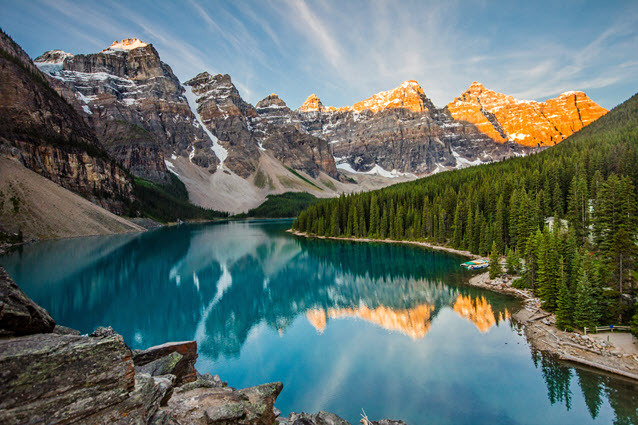 With its diverse landscape and culture, as well as its high quality of life, Canada is an attractive destination for investors looking to purchase a vacation home or a rental property. However, U.S. buyers may not be prepared for some of the differences they will find in the Canadian real estate market. The Canadian housing market is considered very stable, which is due in large part to some of the standards that set it apart from the American housing market. For example, more than half of all borrowers carry some kind of mortgage insurance (as opposed to about 30 percent of U.S. homeowners), and they carry it for the full life of the loan. The insurance isn’t canceled once equity accrues, like with private mortgage insurance in the United States, which is typically canceled once the loan value drops below 80 percent of the value of the home. Therefore, lenders are protected in case the borrower defaults. Perhaps one reason why so many homeowners carry mortgage insurance is that they are fully responsible for the loan, even if they default. Even if homes are foreclosed, lenders may still come after borrowers for their assets or even to garnish their wages to satisfy the debt. The way loans are structured differs, as well. Most Canadian mortgages are issued for a fixed rate for five years. After that term, the loan is re-negotiated for another five years. Mortgage interest is compounded semi-annually, rather than once a month, and it is charged at the end of the month, not the beginning. Mortgage interest is not tax-deductible, but homeowners also don’t have to pay taxes on capital gains when they sell their homes. Anyone who tries to pre-pay their mortgage will have to pay a stiff penalty. Since mortgage interest is compounded differently, your payments will not be the same as they would for the same loan terms in the United States. In most cases, you will actually pay slightly less due to interest compounding only twice annually. For example, if you buy a $250,000 home with a $200,000 loan at a 5 percent interest rate, you can expect to pay $1,067.38 in principle and interest every month. For the same loan terms in the United States, you can expect to pay $1,073.64 in principle and interest. When you are working out your expected financial contribution, it is also worth noting that you will be required to make a down payment of 25 percent for homes that cost less than $400,000 (or 35 percent for homes that cost more). By using the above calculator, you can determine your financial obligations for buying a home in Canada so that you can make the right financial plan to meet your personal investing goals.